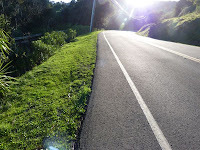 This afternoon I continued walking on Paradise Drive and Trestle Glen on the Tiburon peninsula. 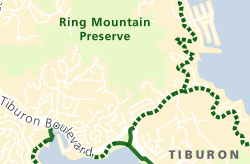 Paradise Drive, a winding road with narrow setbacks, is not part of the developed SF Bay Trail, and as such is shown as a dotted, dark green line on the latest Bay Trail map set). 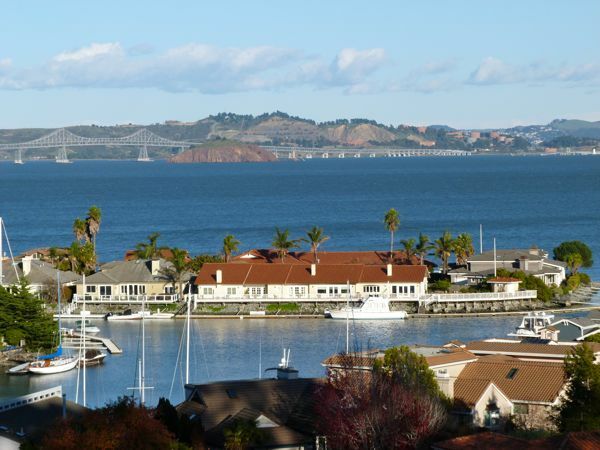 Paradise Drive offers scenic views on the Bay side (on the north side, often between trees) and wooded hills on the Tiburon peninsula (southwest side). I followed a stretch of Paradise Drive and enjoyed intermittent glimpses of the Richmond-San Rafael Bridge, homes below by the water (Paradise Cay) and the Tiburon Yacht Club, as well as a few ships gliding by on the Bay. 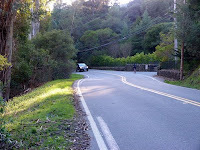 I concluded this walk by turning onto Trestle Glen (like Paradise Drive, a road marked as an undeveloped trail segment, shown as a dotted, dark green line on the 2012 - 2013 Bay Trail Map set). 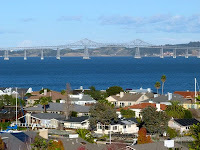 Trestle Glen connects Paradise Drive and Tiburon Boulevard on the Tiburon peninsula. Some stretches of the road have better setbacks than others. 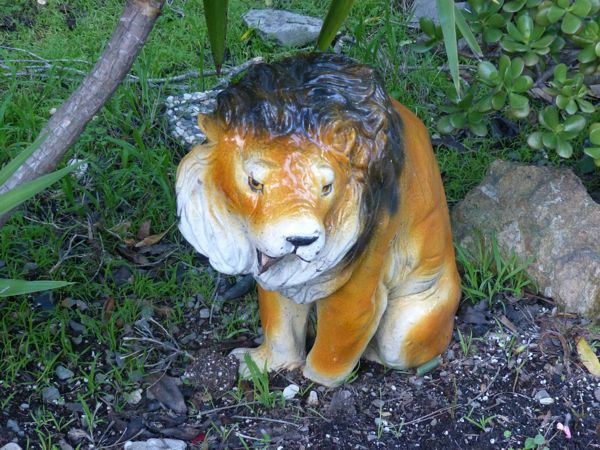 There were small treasures (in yards) that were close to the road, such as the small lion statue shown. And, there might be glimpses of the occasional deer amongst trees, or between yards; although there were none today. 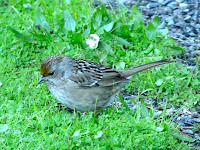 Happily, I saw several sparrows and smaller birds (sorry, I've lumped these together and called them little brown jobs) by the road's edge, foraging about for seeds and insects in the green shoots of grass that thrive in the few winter months here. 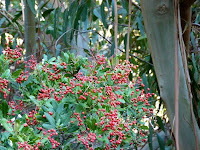 I saw five robins (mostly high up in trees) -- more than I remember seeing for many years. 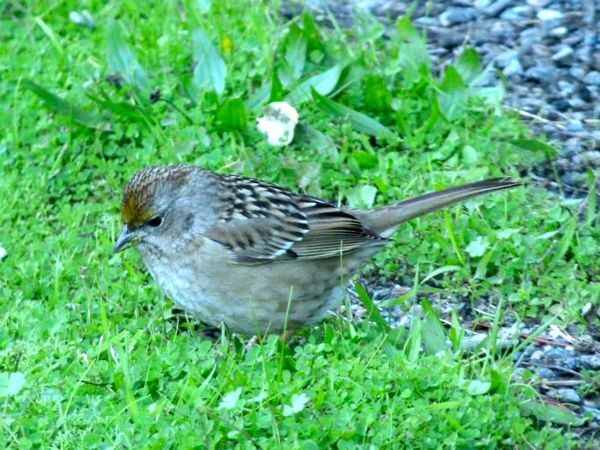 One can hope they're making a comeback after being affected by the pesticide DDT (which weakened bird eggshells and led to bird die-offs) back in the 1960s. 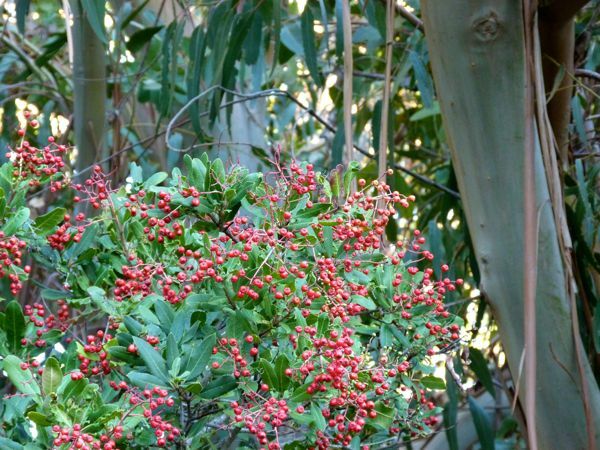 During my first walk around the Bay Trail (2009-2011) I spotted 30 robins over 1,000 miles of walking. So, these five robins this afternoon represent a relatively large percentage of that previous total. 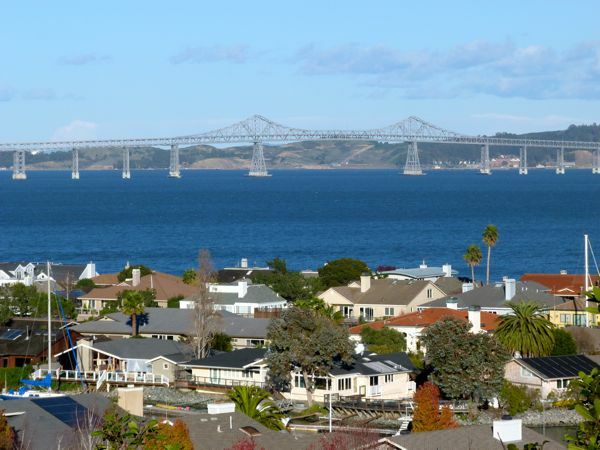 (As of today, I've covered about 1/3 of the Bay Trail on my second trip around the Bay, and have spotted 10 robins total so far. About the same, but they're concentrated in certain habitats, so that doesn't tell the whole story. One park with an inviting lawn and some interesting worms might attract a cluster of robins, whereas a long stretch of shoreline might not.